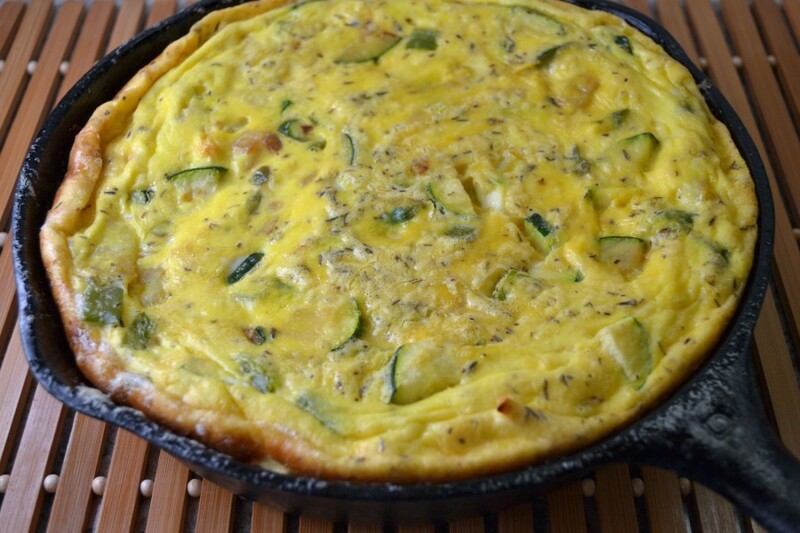 There are a couple different ways to make a vegetable frittata. You can put it straight into the oven casserole style, or you can start it on the stove and move it to the oven. Either way produces that delicious eggy goodness. In this unpublished Paula Peck recipe, the oven only approach is suggested. However, I found that the stove-to-oven method works equally well here and allows for a one pot meal (so to speak). Just saute the veggies in an a large oven proof saute pan and once soft, add the eggs. When the eggs begin to set, drizzle a little olive oil around the edge (this is optional but helps reduce sticking) and put it in the oven. Just like the cooking method, the selection of vegetables can also vary. Local asparagus is abundant right now so this seemed like an obvious choice. Broccoli, green beans, potato, tomato, or even cauliflower would be tasty as well. With just a few substitutes, this regular vegetable frittata can become a fancy “Spring” or “Summer” frittata – ready for its brunch debut. Preheat oven to 325 degrees. Heat oil in a large skillet. Add zucchini and asparagus (if using). Saute, turning frequently until golden and tender. Grease a 9 inch ceramic dish or its equivalent. Combine celery (if using), green peppers, onions, and garlic. Place a third of the mixture on the bottom of greased dish. Sprinkle with salt and pepper. Make a layer of sauteed zucchini on top, then another layer of vegetables, seasoning, and finally another of sauteed zucchini. Beat eggs, adding cream, Parmesan, thyme, salt, and pepper. Pour over vegetables. Bake for 30-45 minutes or until egg is set. Cut into wedges to serve.